The divider style can appear as Thick, Thin, or Pane Splitter. Strangely, the Thick and Pane Splitter styles look nearly identical with the only difference being that you can change the color of a Thick divider but not a Pane Splitter divider. 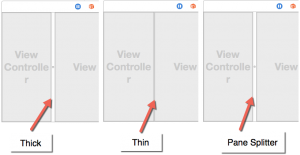 To choose a divider style, open the Document Outline pane and click on the Split View. 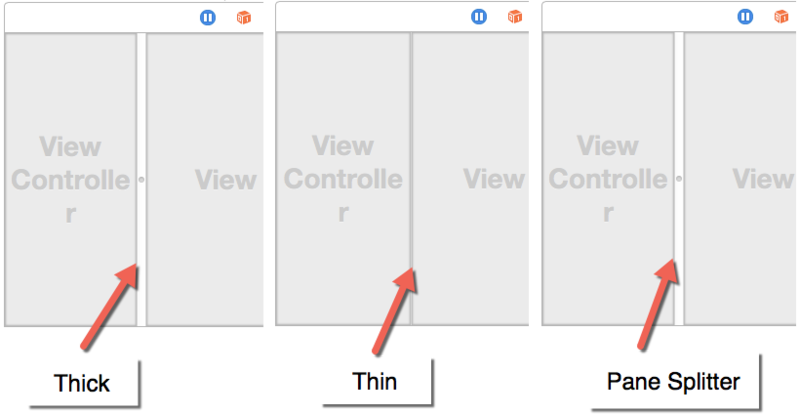 Next, open the Attributes Inspector pane by choosing View > Utilities > Show Attributes Inspector. In the Style popup menu, choose the style you want for your divider. Changing the color of the divider is a bit stranger and trickier. 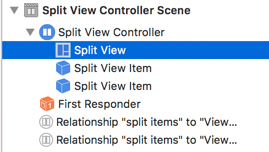 Open the Document Outline pane and click on Split View. Now open the Identity Inspector pane by choosing View > Utilities > Show Identity Inspector. 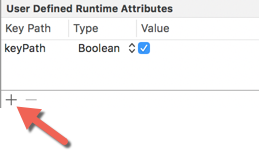 Look for the User Defined Runtime Attributes category and click on the + icon. This creates a generic row of data listing keyPath, Boolean, and a check mark. Double-click on keyPath and change this text to dividerColor and press Return. Under the Type column, click the popup menu and change Boolean to Color. Under the Value category, click the popup menu that appears there and choose a color. 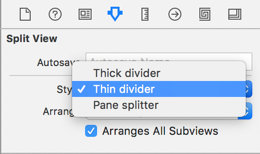 If you chose a Thick or Thin style (not a Pane Splitter) and defined a color, run your project and you should see your chosen divider style and color appear in the split view.